What can we say about a culture where so many houses are built with a front door that never gets a deck or stairs to enter it? One local says he calls them “Mother-in-Law Entrances”. The truth is – they always use the side door, that goes directly into the kitchen. Who cares if the front door is only occasionally used as a large window? 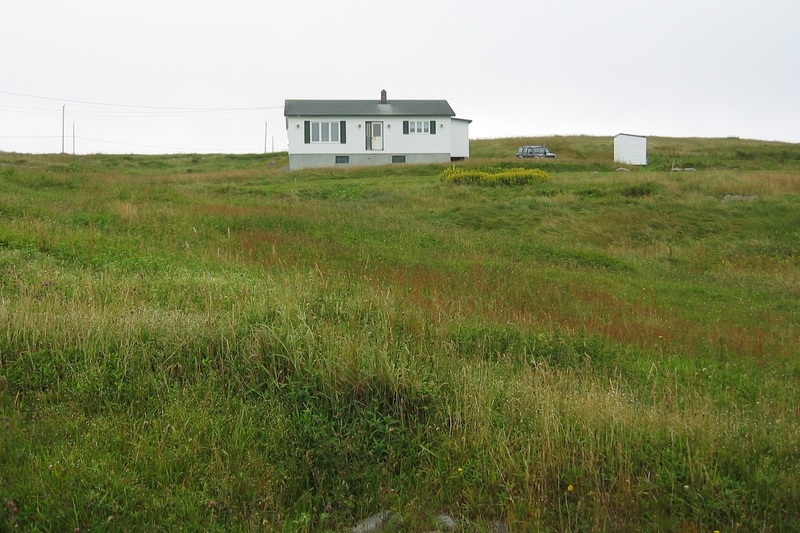 Newfoundland is raw, rugged, and uncivilized in a very positive sense. They do what’s important. They often leave a ladder on the roof so it’s easier to get up there to get the snow off. They rarely bother with a “grass” lawn, although they’ll certainly decorate up their yards with whatever is available (painted buoys, rocks, antlers). They can’t really afford to re-paint their houses every year, which (from the looks of them) would be required to keep them well maintained. They need lots of firewood. We saw one old school bus that had been recycled as a storage bin for firewood. The only industry in most of the province is fishing, and they are small independent fishermen. We saw one man chopping the heads off fish with a chopping knife. We saw one man with a pitchfork, loading hay onto a flatbed wagon. They’re concerned that people from outside are buying up property there to build summer houses, and that the island will become too much of a tourist destination. That’s so against the grain of a year-round cycle of planning and community, with a focus on using their natural resources to survive, that it just doesn’t fit into their culture. On the other hand – all their fruit and most of their vegetables are imported from the U.S. I’m not sure where their beef and poultry come from. They have bakeries for bread and rolls, and fresh seafood – and the meat from moose and caribou. They have a problem with moose the way we have a problem with deer in Ohio – there are just too many and no natural predators. The moose are dangerous and are destroying the environment other animals depend on. All the Newfies we met were open, friendly, and unassuming. If we were stopped off the road they just went around us. They waved. They’d stop and talk for a while. They welcomed the Americans who stayed there on 9/11/2001 because their flights had been grounded. But with the exception of St. John’s, they are so thinly distributed and have such poor natural resources that it’s scary to think they’ll survive much longer without some change. The small fishing villages – can they really survive without having an inflow of people to work them? As soon as we arrived in Nova Scotia the changes were dramatic. Houses and boats looked newer. People honked if you were in their way. There were lots of cars on the roads. We wouldn’t have noticed it quite so much if we hadn’t come from Newfoundland. Just read through the latest set of updates. WOW. Lots of great scenery and interesting info on the culture. I’m following along on my Microsoft Maps and Streets software as you tell where you are traveling. Helps me since I’m not familiar with NL. won’t say if i agree or disagree with your comments on my island. we newfies are just to polite to do so. Yes, I’d say the Newfies I met were very polite. But I do wish you’d provide your perspective! I keep thinking of things we didn’t include – like a discussion of the music being a combination of Zydeco and Irish drinking songs (OK, so I only got a small taste). You have a wonderful province – I hope it stays that way! i will comment on the people who buy up property in my community.any home close to the sea sells rather quickly here in the community (pop 343) we have seen a few retired americans buying and living here in summer. some now actually stay year around.after a year or so you can’t tell them from the locals here. they get involved in the community and volunteer at our functions. they might not be appreciated as much elsewhere but here were proud to call them friends.